Breakfast on the house free Wi-Fi and a location near scenic attractions make the Executive Inn a wallet friendly option in the Ozarks. 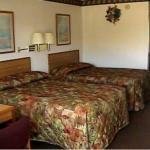 Each of the property's 32 rooms offers free Wi-Fi a cable TV microwave mini-fridge and desk. Belly up to the free continental breakfast bar before you hit the road. Pets are welcome and parking is free.Located on Highway 62 one block from the Village Mall the Executive Inn is four miles from the links at Big Creek Golf and Country Club. Drive 15 minutes to Norfork Lake and the Miniature Museum of Merritt. Buffalo Point in Buffalo River National Park is 50 minutes south and Bull Shoals Dam is 25 minutes west. Tecumseh Missouri is a half-hour north and the folk music venues in Mountain View are 50 miles south. Boone County Airport is 55 miles west and Branson Airport is 85 miles northwest in Missouri.